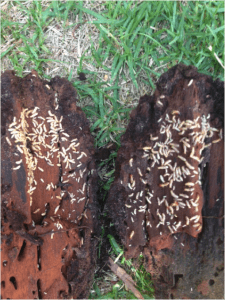 Are there termites in our Geelong region? Are there Termites in the area? I get asked this question quite a lot: Termites are found in every mainland state. Tasmania does have grass eating termite species but these are generally not invasive into homes. Our Geelong, Bellarine and Surf coast region has quite a few invasive [to homes] termite species. Two of our local termite species can be found in homes causing massive damage to structural timbers. The rest are usually only found outside in living or decomposing trees. Termites behave a little like honey bees in their basic routines. Like bees they have a central colony in which the single matriarchal Queen resides with her male drones. She is locked in this breeding chamber for her whole life and becomes one of nature’s best egg laying machines. Our termite queen can live for 25 to 28 years. In her later years she can lay over 800 eggs a day. She can often oversee a population of 2.5 to 3 million workers in her extended colony. Like bees, the workers [sterile females] leave the colony as the day warms up [in summer here in Geelong they operate all night too] travelling from the colony to the food resource. This food resource can be over 100 meters from the colony and the worker might spend an hour in travel time. Over the next few minutes the worker then harvests her load of food, turns tail and heads back to the colony with the much needed food for her siblings. Like the bee every worker, soldier, nymph and reproductive is her sister or brother. The worker termite never stops, she needs to tend her colony harvesting food, feeding the soldiers, the queen, nymphs and larva. She cleans up rubbish, helps build new sections of the nest, stores food for the winter months and disposes of the sick and dead. Her life is short, only a few years, but very eventful and productive. Soldier termites are the Amazonian warriors of the colony, these girls have attitude. They are quick to rush to a fight and defend to the last their sisters and mother. Soldier termites have three defensive tools to draw from, numbers in their ranks, a set of formidable mandibles to attack and hold with and some species have a chemical warfare ability. A pore on top of their head that exudes a sticky acidy substance. The most common foe of termites are predatory ant species, black ants, bull dog and sugar ants. 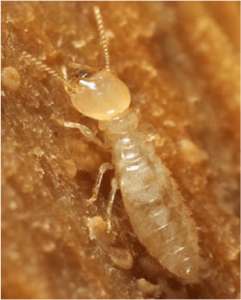 Soldier termites have a much easier life than workers, but there are far fewer of them in the colony. A young colony might have only one soldier per 200 workers, a mature colony usually has a ratio of one to every twenty workers. The life span of soldiers is usually 2 to 3 times longer than a worker five to eight years. The soldier is the termite caste that the pest control technician uses to identify the species at hand. The size of the body, she shape of the head, flat or domed and the mandibles are some of the key indicators as to the species. Good pest control technicians can even tell a sub-species by what termite soldiers do and how they behave. Identifying key points like where the damage timbers are in the home, what it looks like, termite faecal pellets, the colour of packing mud, termite behaviour and the physical look and behavioural habits of the termites themselves. Having this ability to identify species and sub-species gives us clues as to how best to successfully combat this invasive and destructive pest. The treatments we use; the physical and chemical tools we have and the way we use them is tailored to each home differently and we need to have an insight into how the termites work too. Homes are built in different ways, slab on ground-raft slab, waffle pod, in-filled slab are three common but very different concrete slab on ground home slabs. Then there are suspended floor homes, timber, concrete, brick base and steel stumps. Retaining walls in sub-floors is another consideration along with soil types, drainage issues, water tank overflows, hot water vents etc. 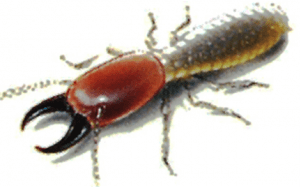 Do you use baiting systems to control termites? Our local termite species are far too timid to play this game! Be warned baiting will never be an option or a solution to protect your home from our local termites. How should we protect our home? Nine times out of ten a liquid barrier treatment is the best option to protect buildings from termites. These barriers are long lasting and very effective. We have been installing liquid barrier treatments for over 15 years and have complete success. You might also need to modify different aspects to parts of your home, this is usually improved drainage, fixing plumbing issues, slightly changing landscaping or removing watering systems..
Acacia will always stand by our work, we are a small business here in Geelong and our reputation is our guarantee.